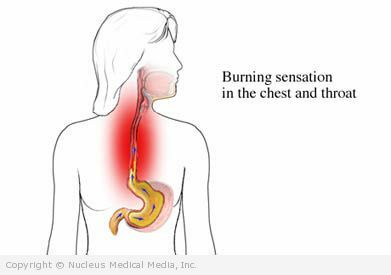 Heartburn is a burning sensation in the lower chest. It is the main symptom of gastroesophageal reflux disease (GERD). When you eat, food travels down the esophagus to the stomach. The muscle between the esophagus and stomach lets food enter the stomach. When this muscle weakens, stomach acid flows into the esophagus. This causes a burning sensation, called heartburn. Genetics may also play a role in developing GERD. Heartburn symptoms usually occur after overeating or lying down after a big meal. The symptoms may last for a few minutes or a few hours. Barrett’s esophagus — This is a precancerous condition of the esophagus that has no unique symptoms. However, it can be diagnosed by endoscopic exams. It is common to experience heartburn occasionally. But, if you have frequent episodes of heartburn (like twice a week), make an appointment to see your doctor. Also, call your doctor if you have any symptoms that are listed as complications of reflux, especially symptoms of esophageal damage. If you are not sure of the cause of any pain in your chest, call for emergency help right away. Keep a food diary of what you eat and what the reaction is. Make gradual changes to your diet and record the results. Allow at least 2-3 hours between meals and lying down. Avoid belts and clothing that are too tight. This may increase pressure on the abdomen. Elevate head of bed 6-8 inches. If symptoms are severe and you cannot tolerate the medicines, surgery may be an option. The most common surgery for heartburn is fundoplication. The doctor wraps the stomach around the esophagus. This creates pressure on the muscle at the opening to the stomach. If you have a hiatal hernia, it can also be repaired at this time. In some cases, the surgery can be done with smaller incisions, called laparoscopy. An advantage of endoscopic techniques is that they do not involve incisions in the skin. Instead, the doctor inserts a lighted device called an endoscope through the mouth and down the esophagus to reach the first part of the stomach. Through the endoscope, the doctor can perform one of a variety of procedures that decreases the backward flow of stomach acid into the esophagus, including transoral incisionless fundoplication (TIF). If surgery or endoscopy is successful, you may not need to take heartburn medicines anymore. Sit up for 2-3 hours after eating. Change your diet to avoid certain foods. Chew sugarless gum for about 30 minutes after a meal. This will increase saliva flow, which can neutralize stomach acids in the esophagus. BE = This therapy has the best evidence available showing that it is effective.